Mary can help us open our hearts and eyes to the needs of our brothers and sisters. 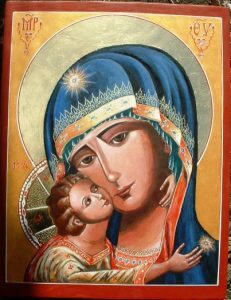 She motivates us to acts of love and mercy through her maternal grace. Her tenderness and love has the force of faith. It can be compared to an army ready for battle. She is strong against evil, but with an inner peace and tenderness that she transmits to us. In entrusting ourselves to Mary…we will better understand the mercy of God, and we will welcome it more for ourselves and for others.